The 25 blogs presented here are a great source of inspiration and practical tips for trainers and coaches. 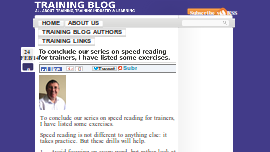 Visit these blogs if you’re looking for new training exercises (energizers, ice breakers, etc. ), motivational stories from other trainers, industry news and trends, or great advice on how to grow your training business or gain management buy-in. 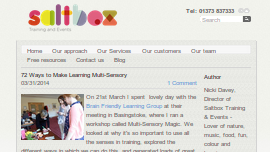 Please note that the blogs are ordered alphabetically within each category. So here, the top 25 means: out of all the other blogs. 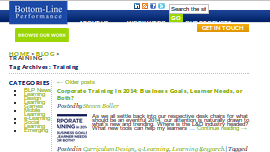 The blog posts on Corporate Trainer are a mix of the training experiences of the author, Peter, and practical advice. An example of the former – personal posts – is 9 challenges all trainers face (“Our work is going virtual, that is scary”). An example of the latter is 14 ways to make a training program work. 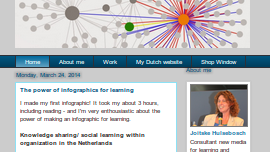 Joitske Hulsebosch specializes in new media for learning. The insights relayed on her site apply to training as well. Her creative way of thinking shines through in blog posts such as The power of infographics for learning and 10 tools challenge: making youtube playlists, about the dangers and benefits of using online tools in your training business. Regardless if you are an “Accidental Trainer” or an accomplished trainer with years of experience, if you like to be challenged in your thinking and have a passionate, authentic voice in your reading matter, this blog is for you. Start with 3 Things this learning rebel would tell my “new trainer” self. Learning Rebels Mission Statement: Passionately Embracing Unconventional Ideas in Learning Today. SaltBox takes an unconventional approach to training. Their blog posts, just a few so far, are personal accounts of their training experiences. They also like a good party as they relate in the post 5 Reasons to Celebrate your Business’s Birthday! 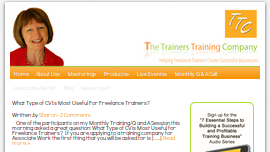 The Trainers Training Company is a great resource for freelance trainers and coaches. Or really for any independent trainer who is looking for advice on how to start, develop and grow their training business. Sharon Gaskin, the founder, writes inspiring and actionable blog posts, such as Freelance Trainers: Are You Using This Simple Strategy to Get Business? She also personally responds to comments, both on this site and in her LinkedIn group Trainer Talk. 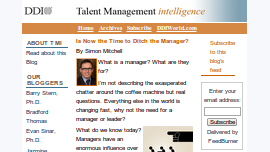 DDI World specializes in talent management. Coaches interested in the field of leadership development should take a look at a few of their posts titled Are We Missing the Mark on How to Develop Leaders? and Leadership: A Career Choice or a Constraint? 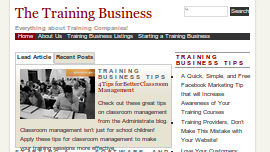 The blog on Bottom Line Performance’s site has a pretty broad scope, but you’ll find their articles tagged training are really catered to (corporate) trainers. Titles include Why Don’t Trainers Worry About ROI? and When You May Not Need a Training Program. 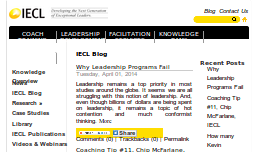 The social learning blog pays attention to trends in corporate training, writing about topics like 5 Things Millennials Want From Training and How To Make The Flipped Classroom Effective In Corporate Training. If you’re interested in learning on the workfloor in general, be sure to visit their blog’s homepage too. This blog contains a number of concise video clips, each providing coaching tips presented in a clear, actionable way. The tips don’t have a clear title (they’re simply numbered), so you’ll have to scan the description for keywords you’re interested in. For example, Tip #7 looks at how to develop direct communication – “the ability to communicate clearly, effectively, and use language that has the greatest positive impact on coaching counterparts”. 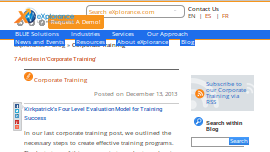 The eXplorance blog has some interesting articles on corporate training. There are posts on the theory behind training, such as Kirkpatrick’s Four Level Evaluation Model for Training Success, and some more practical posts like 5 Steps to Creating Effective Training Programs. 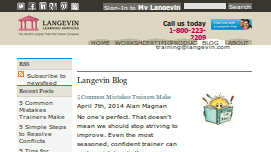 The Langevin Blog offers tips and best practices for trainers, instructional design, training management, virtual classroom, and even non-trainers, with posts such as 5 Tips for Writing Training Objectives. There’s even tips that are applicable anywhere, such as 5 Instructional Techniques for Building Climate and Rapport. The MLR business training blog provides a funny anecdote The Joy of Business Management Training (or not!) and practical advice on Transferring Learning from the Training Room to the Workplace…..What makes this happen? If you, as a trainer or coach, want to start your own blog, you could do worse than following the example of this site. 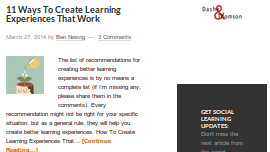 Phase (two) learning has a number of posts about onboarding as well as articles of a more general nature. There’s a very practical post Bring Your Own Workshop Stuff and an article titled Adult Learning Principles: A Quick Refresher. 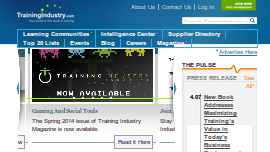 The Training Business’ most recent post dates back to August 2013. I do hope they keep posting, because there are some real nuggets on this site. Such as A Quick, Simple, and Free Facebook Marketing Tip that will Increase Awareness of Your Training Courses. The Training Clinic offers down to earth advice for trainers. For instance, Try a Cocktail Exercise! After lunch. A dreaded time for all trainers- and learners! Increasing participation is a must and raising activity is a double blast to boredom. The cocktail exercise accomplishes both. In another post, they talk about why you should Market Your Training Function. 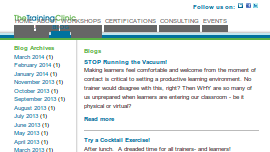 I like the Training Clinic for their unconventional approach in choosing titles: Need to Increase Attendance? MOB Them! 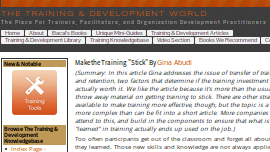 “Training & Development World” hosts articles on practice and theory behind training. Here, you’ll find articles such as A Simple But Powerful Training Model For Trainers and Make the Training “Stick”. With the Training Blog on trainingdirectoryuk.com you’re going to have to cherry pick the interesting articles. 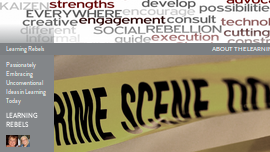 Be amazed at how many training related acronyms there are, for example. Or pick up advice on How to make your internet business stand out above your competitors, in case you’re providing online training. 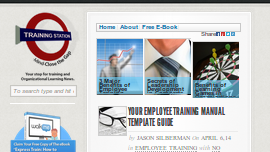 Training Station specializes in organizational learning and employee productivity, meaning its articles are mostly about corporate training. Topics include How to prevent employee disengagement in training and Corporate training activities to improve the learning process. TrainingZone actually features multiple bloggers. This means they cover a wide range of interesting topics such as 7 Pricing Secrets All Coaches Should Know and Five suggestions for making training more memorable. To read some of the articles, you have to be registered, but hey, registration is free! 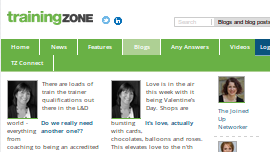 All in all, TrainingZone is a very valuable resource of actionable information and training tips. 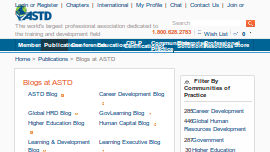 It’s easy to get lost on astd.org. There are many pages and articles, not all relevant to trainers and coaches. 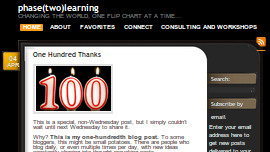 Some blog posts are really introductions to books or other commercial items. But there are some nuggets as well, such as Five Tips for Success When Using Games in Training and How Effective Is Executive Coaching? 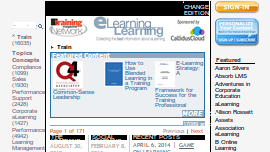 For trainers and coaches, probably the most interesting section of the site is the Learning & Development Blog. As the name implies, this site does not cater specifically to trainers and coaches. 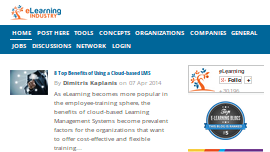 I have included elearningindustry.com nevertheless, because they regularly post interesting articles, such as Can Your Training Sell? Many of their articles are written by training experts, listed on their bloggers page. 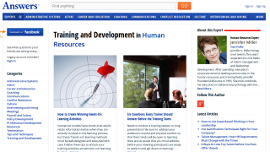 The training section of eLearning Learning hosts a number of articles on (corporate) training, mostly in the context of e-learning. 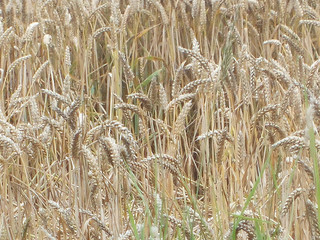 Many titles on this site link directly to other sites and that’s a good thing. You’ll discover other useful blogs this way. They’re also able to cover a wide range of topics, from 3 Simple Ways to Improve Compliance Training to 5-Steps for Creating Effective Employee Training. Even if you’re not interested in e-learning, you should still check out this site for its variety and broad scope. You’ll be sure to find something of interest. 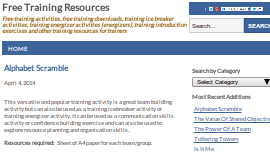 The name says it all, Free Training Resources is not actually a blog but a very handy collection of icebreakers, energizers and introduction exercises. And really any type of training resource. While not an actual blog, this subsection of answers.com is interesting nevertheless. It contains introductory level articles on topics such as Four Types of Training Activities that Work and How to Create Winning Hands-On Learning Activities. “Your portal to the world of training” as they call it, is indeed a portal-like site. It features many in depth articles, overviews of the state of the training industry, such as Size of Training Industry, and advice for training executives, for instance Building Trust And Collaboration In The Training World. Nice List. I enjoyed this blog post. It was inspiring and informative.